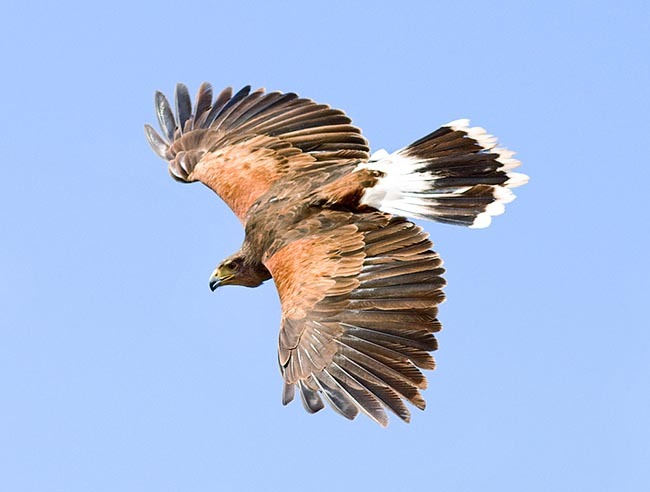 The Harris’ hawk, also known as Bay-winged hawk (Parabuteo unicinctus Temminck, 1824), is a bird of prey of the New World belonging to the order of the Accipitriformes and to the family of the Accipitridae. Since ever confined in the American continent it has become during the last decades one of the most known raptors in the whole world not so much for its natural diffusion but only for the fact that it has been chosen by many falconers as the most suitable for this art. There is no TV programme or falconers exhibition not proposing the presence of this particular but docile animal. Though many consider it in nature as a fierce and cruel bird of prey, this bird, if suitably trained, shows an affective attachment to its instructor that at times goes beyond the usual limits of a relationship between an animal and a man. For these characteristics it has gotten various nicknames evidencing its character and behaviour. In nature, it has been often called wolf hawk for its way of hunting in group whilst in the captivity status they have simply changed the reference from wolf to dog. It seems in fact that it becomes attached to the owner like a docile house dog. It is often used as deterrent against pigeons and seagulls in the cities and by the airports. This hawk, only species of the genus Parabuteo, has little of the hawk but is not completely a buzzard even if morphologically closer to it. So much that Teminck when did classify it did choose an intermediate solution that still now resists at scientific level. Parabuteo comes from the Greek “para” = alike, looking like, and from the Latin “buteo” = buzzard, confirming his dilemma and unicinctus from “uni” = one and “cinctus” = belt for the unique and ample black belt crossing longitudinally the very white tail. 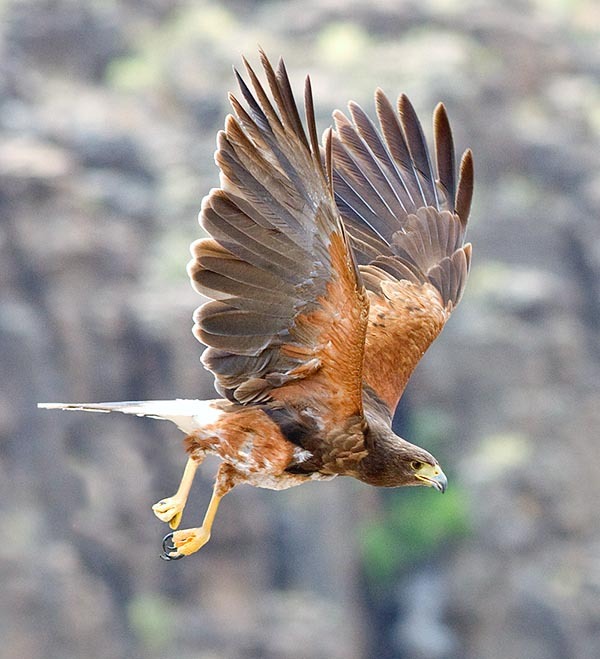 By sure, in the animal world it is most known as Harris’ hawk or buzzard, name given by the famous American ornithologist and naturalist Audubon in honour to the naturalist Edward Harris, friend and partner of several campaigns done together on the North American soil. Also the vulgar name given to this bird in various countries reflects this indication. 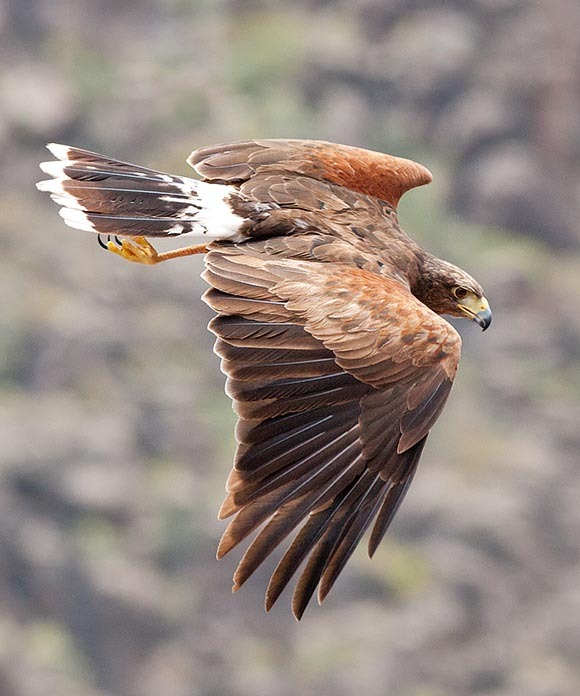 In English, Harris’ hawk, in French, Buse de Harris, in Spanish, Busardo/Aguililla de Harris and in German, Wüstenbussard. This species is native to the American continent and occupies an extremely vast area being diffused from Texas to Argentina. In more detail, it lives the regions of south-western USA and through the whole Central America it almost completely occupies te southern part of the continent up to Patagonia and Chile. It is not a migratory bird even if, at times, it does mostly seasonal movements looking for preys. It indifferently lives in temperate or tropical areas adapting easily to the various meteorological situations. It is plain raptor and frequents savannahs and bushy forests preferably arid and predesert locations but does not disdain, in its southern range, to frequent river streams or thicker woods. It does not love to reach altidudes over the 1000 m.
The preferred habitat and that is often associated to its scenographic presence, are the arid plains with sparse spiny bushes and big saguaros and palovedres, much loved locations for the nidification. These extremely spiny cacti that protect them from terrestrial attacks are also their preferred posts for the observation of the territory and are unfailingly used for the group hunting. Like the wolves, they merge in huge families that may reach even to 15 specimens and together do a pitiless hunting to their victims. These are usually rodents, big lizards, hares and wild rabbits and not seldom snakes. Once a prey is sighted, the group leader, usually a male, dives steeply to attack and often is the case the victim shelters into the low bushes that are then surrounded to all participants that enter them, ready to drive it out. All take part to the meal following the hierarchical order. It’s a bird flying not too high preferring low glides starting from their favourite post for reaching other ones. Like many raptors it seems to be reducing due to the decrement of their habitat but it seems that they are gaining territory conquering cultivated and inhabited areas. 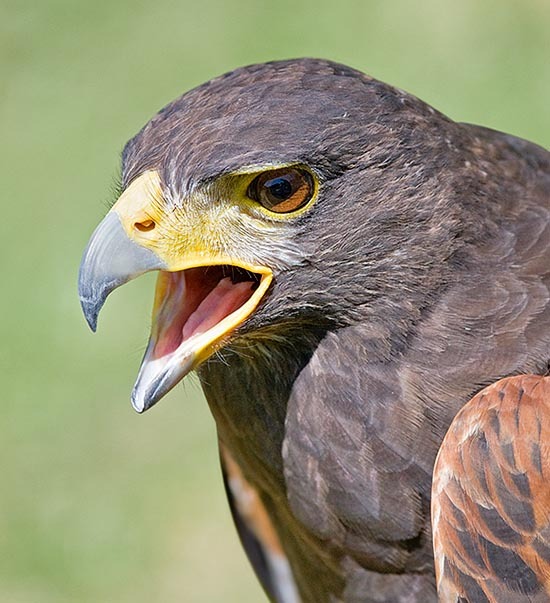 The Harris’ hawk is a medium sized raptor with exceptional capacity and skill in flying and by sure this has been the reason for its destination to the falconry. It exceeds the length of 50 cm with a wingspan of 130 cm and a weight standing between the 800 and 1200 g for the female which is, like for all diurnal raptors, markedly bigger. The flight of this bird has not the sudden flashes of a goshawk but having fairly elongated wings is able to perform respectable stops and sudden changes of direction. Its courage is then assisted by very long and strong claws allowing him to inesorably seize the prey. 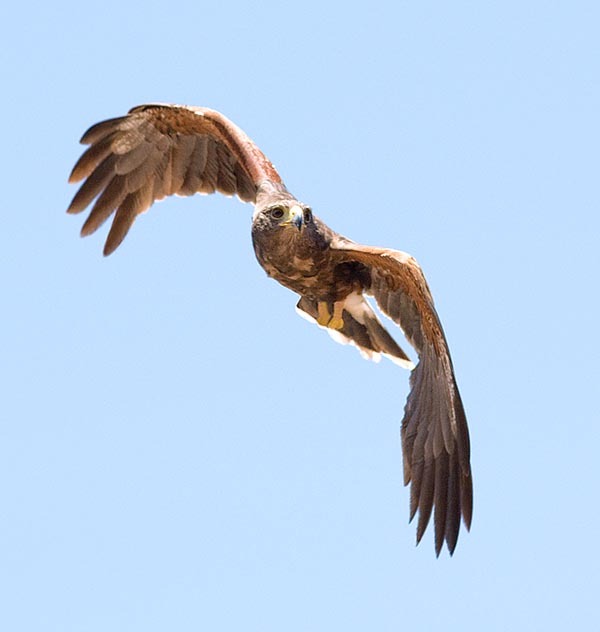 The adults have the body totally dark brown with reddish brown alar coverts well visible in flight and in contrast with the black remiges. The tail, lower abdomen and rump are, on the contrary, bright white. The tail is crossed in the mid by a wide black belt of about 10 cm that leaves a white terminal part of some centimetres. The juveniles, similar to the adults in the livery, have also them the dark chest, but white spotted. The beak is much hooked with well pointed yellow rostrum with blackish tip and completely yellow legs. The eyes are dark. The yellow cere is quite evident. Three subspecies have been classified distinctly linked to their occupied territories and to the dimensions. These are the Parabuteo unicinctus superior, Parabuteo unicinctus harrisi and the Parabuteo unicinctus unicinctus, respectively referred to the north part, the central and the southern ones of the American continent. As aforementioned, the North American saguar appears to be the choice place where to build their nest. In other locations, it usually chooses small trees where it places its nest, farly compact, formed by small twigs and inside covered by dried and soft bushes. This raptor reaches the sexual maturity around the third year. It is a very social bird and lives in communities hierarchically structured for the hunting as well as for the nesting. As a matter of fact, unique case among the raptors, it foresees a mutual assistance during the nesting. Inside the groups, we note instances of nesting families formed by one female and two or more males that cooperate in the defence and the growth of the progeny. Surely a form of polyandry. It lays two to four eggs usually white-light blue with small grey spots that are hatched for about 35 days usually by the female. The youngs leave the nest after about 50 days. Another case not met in the raptors and probably due to the presence of a widened family, this buzzard can nidify several times a year, practically without any interruption. In the group, only one couple is in charge of the nidification, as it is assumed that the members of the team do belong to the same familiar stock. The nest is subject to predation mainly from eagles, eagle-owls and from multiple hawks attacks. The maximum longevity observed is of almost 15 years. It is a protected bird and where it is not as such is by sure worthy of protection as it takes care to the hunting of rodents harmful to agriculture.